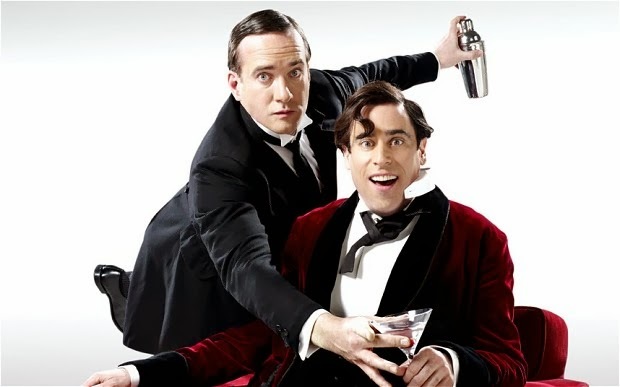 Jeeves and Wooster in Perfect Nonsense is a new West End comedy based on the infamous duo originally created by P.G. Woodhouse. I might be too young to remember the television show from the early 90s (with Hugh Laurie and Stephen Fry), but this new production similarly features two exceptional comedians: Matthew Macfadyen and Stephen Mangan (with support from Mark Hadfield). Perfect Nonsense couldn’t be a more fitting title. The actual plot is typically farcical guff (something about a cow creamer, an important notebook and matchmaking – it’s easy to get lost), involving upper-class toff Bertie Wooster and his omniscient butler Jeeves who frequently saves the day. It’s all incredibly tenuous, but the wordy script is almost irrelevant – the plot is simply a vehicle for the play’s silly fun, jam-packed with visual gags and slapstick humour. Comedy is squeezed from every ounce of the production, from piecing together and rotating the well-constructed set, makeshift props (the car especially), sharp lighting changes, sound cues and cross-dressing, not to mention the performances that highlight the play-within-a-play structure by breaking the fourth wall with hilarious effect. The first act suffers from a few dips but the second act is sharper and speedier with laughs aplenty. Most of those laughs stem from the cartoonish characterisation from the three-strong cast. The narrative centres on Wooster, played by Mangan with a toothy grin visible from the back of the upper circle and a hearty guffaw, his absurd characterisation offset by Macfadyen’s stoic Jeeves. The remaining characters are played by both Macfadyen and Hadfield – a major source of hilarity as they seemingly impossibly switch between costumes and accents with surprising speed and impeccable comic timing. The result is a relentless, fast-paced production that appears almost improvised, forever on the brink of falling apart but slickly directed by Sean Foley. It’s just a shame that much of the action at the front of the stage is obscured by the theatre’s circles. Jeeves and Wooster is simply a terrific piece of light entertainment that’s typically British and cannot be beaten for laughs on the West End stage. Watch: Jeeves and Wooster is running at the Duke Of York's Theatre until March 2014, tickets available here.